The first stop is Thailand’s capital, Bangkok. You’ll discover ancient temples such as Wat Arun, the most iconic temple in Thailand. Explore bustling Khao San Road at night, and on the weekend go explore the Chatuchak Market in Northern Bangkok, the largest market in Thailand, and one of the biggest in the world. Make sure you check out the Wait Traimit (Golden Buddha) Temple in Chinatown before heading off to your next destination! Escape the crowds of the city and make your way by train to Khao Sok National Park, one of the oldest rainforests in the world. Take a dip in the pristine lakes and marvel at the limestone mountains. Step it up a notch and grab some inner tubes to get the party started. Kick back, relax, and have a couple drinks. You can always explore the rainforest in the morning. Take a boat trip and go snorkeling in some hidden spots around the island. Don’t use all your energy though; you’re going to need it for the night, especially if it’s a Full Moon. Full Moon Parties are on the beach, and they make for one of the wildest nights on the island each month. Don't worry if you miss it though, the half moon and black moon parties are just as good! Stay in beachside bungalows so that the morning after a heavy night, you can just step out of your door onto the beach for a day of chilling out and nursing your hangover by the pool! After you’ve partied under the moon in Koh Phangan, forget that you lost your dignity and getaway to the Phi Phi Islands. The number one place on the islands is Maya Bay, a famous filming location for the movie “The Beach,” starring the dreamy Leonardo Dicaprio. Recreate movie scenes, soak up the sun, and have a BBQ on the beach! The Phi Phi Islands also have a really good nightlife scene, with many awesome themed bars dotted around that hold different events each night. Finally, end your trip on a high in Chiang Mai, located on the northern end of Thailand. Explore over 300 Buddhist temples and venture into the jungle where you can get your heart racing on an exhilarating zipline through the rainforest. Visit an elephant sanctuary to interact with these incredible creatures the right way; by feed, washing and playing with them in the river! Finish up your time by taking a hike and chill on a bamboo raft as you float down the river with your new travel friends! 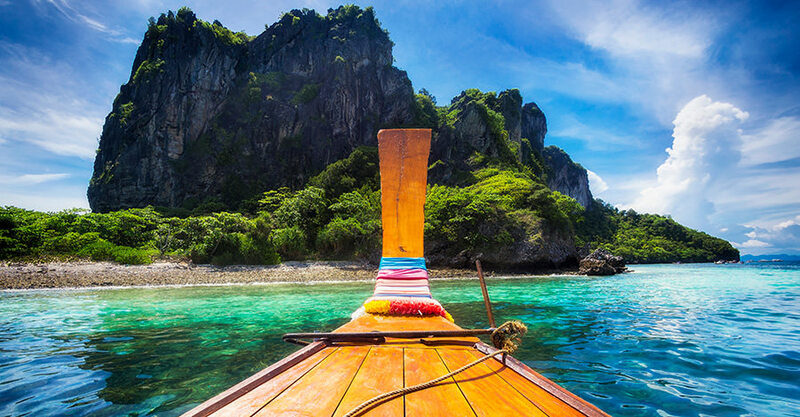 Thailand is waiting for you- make sure you’re ready with some help from Intro Travel. We can make sure you hit up all of the spots mentioned above, travelling with a group of people who are just as excited as you are!